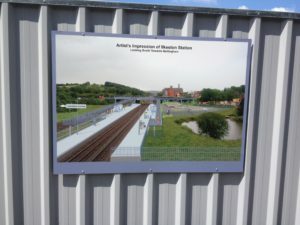 The Ilkeston railway platform, car park and footbridge for the forthcoming stopping service is making strides towards its goal of an Autumn 2016 opening. The Aecom designed station will have two car parks − a main car park with 90 spaces on the east side of the tracks and another on the west-side for disabled drivers, motorcycles and bicycles, a taxi rank and drop off and pick up point. 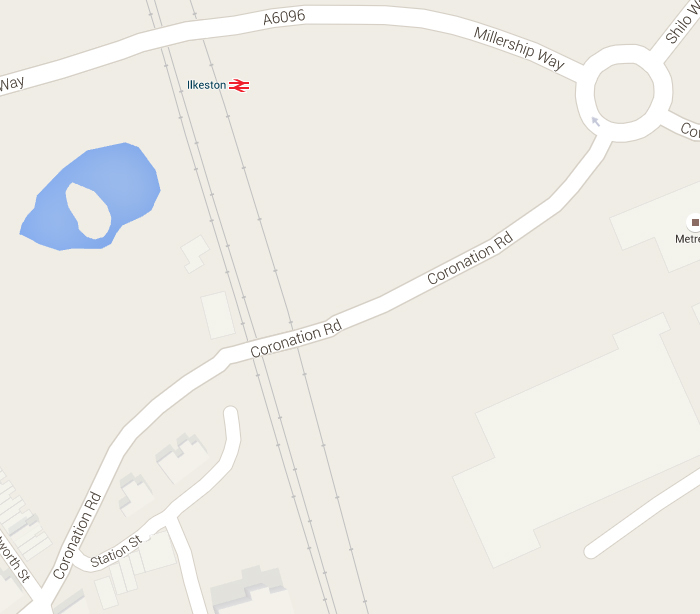 Bus services already operate along Coronation Road and new bus stops with shelters will be built near the station. 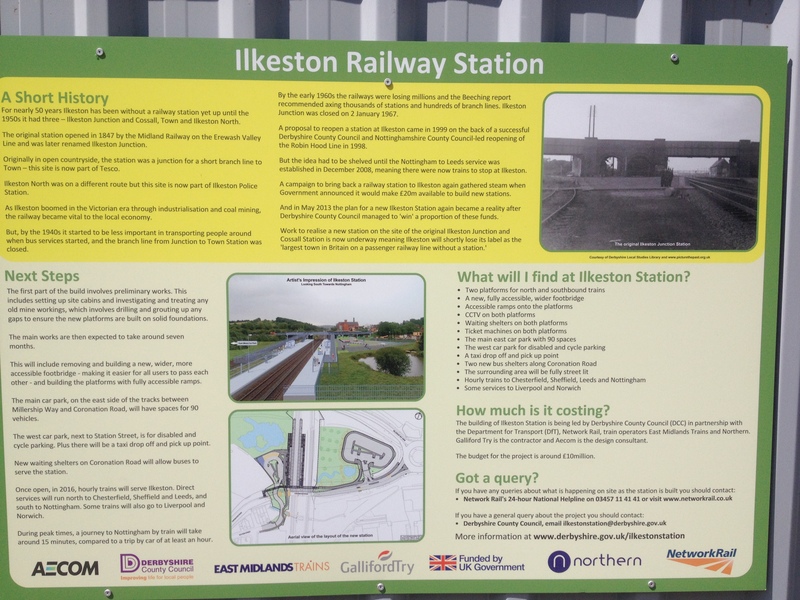 Direct hourly trains will call at Ilkeston and run north to Chesterfield, Sheffield and Leeds and south to Nottingham. 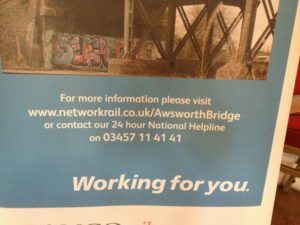 Some trains will also call at Liverpool and Norwich. 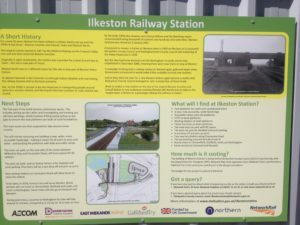 It is estimated 160,000 passengers will use the station in its first year. Progress is looking good with engineers hard at work. 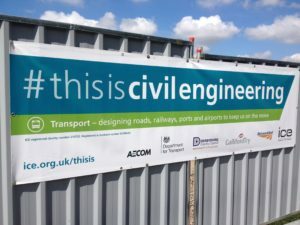 The thumbnail images in this post can be clicked for a larger version. 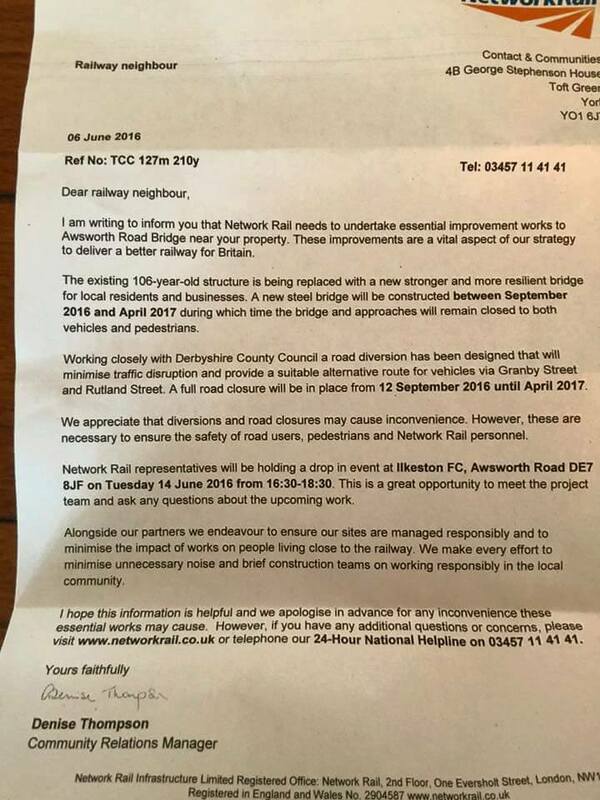 From July 22nd through to August 29th, intermittent road closures will be in place as Network Rail Engineers replace the Coronation Road footbridge with a new one linking the two platforms. 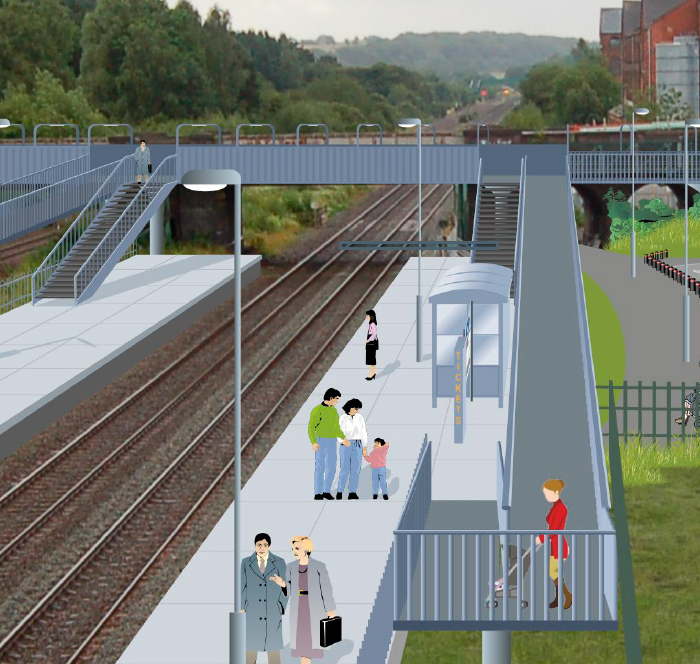 An artist’s impression shows what to expect from the completed design. 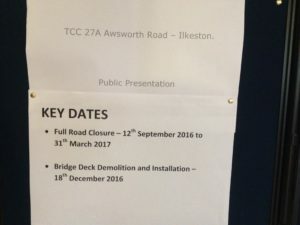 During construction traffic over the road bridge will be reduced. The part of the road to be closed is Coronation Road from the junction with Station Street to the roundabout with Millership Way. 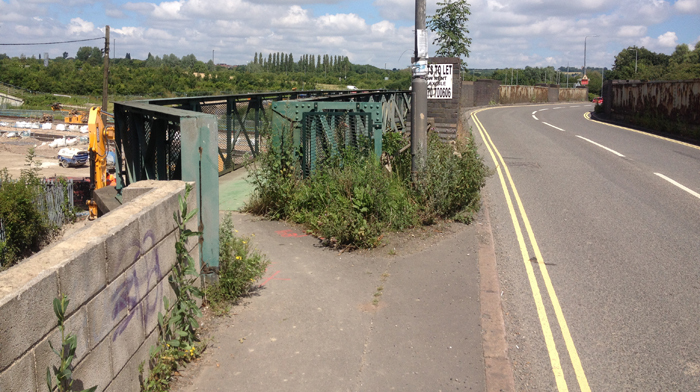 Vehicles will use a single lane to allow pedestrians access over the road bridge using a temporary walkway separated from traffic by barriers. 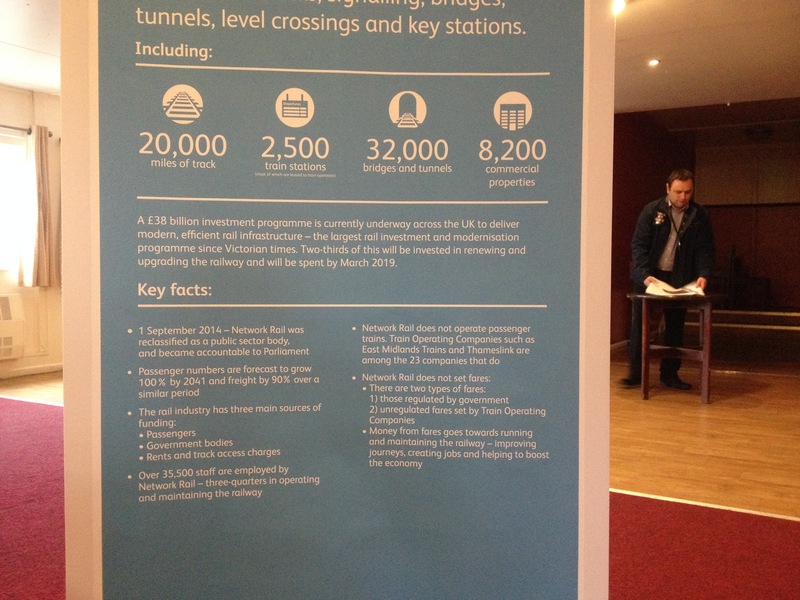 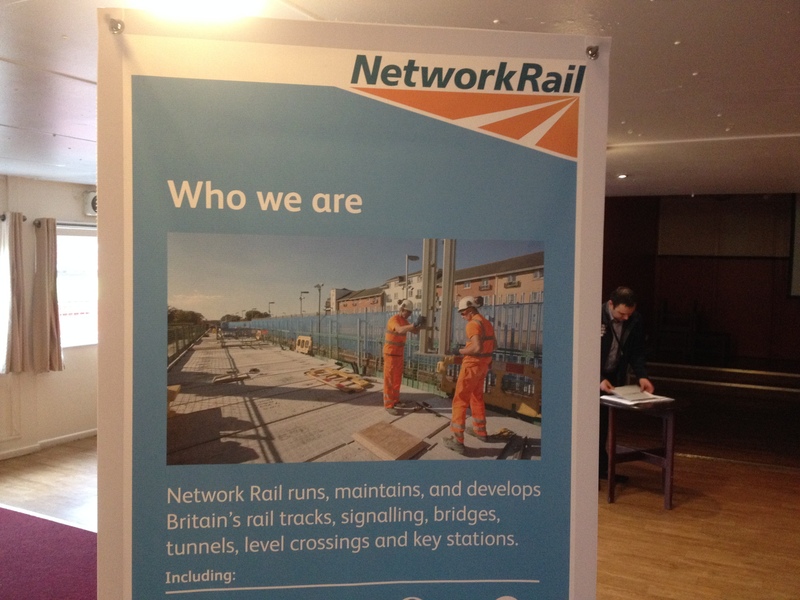 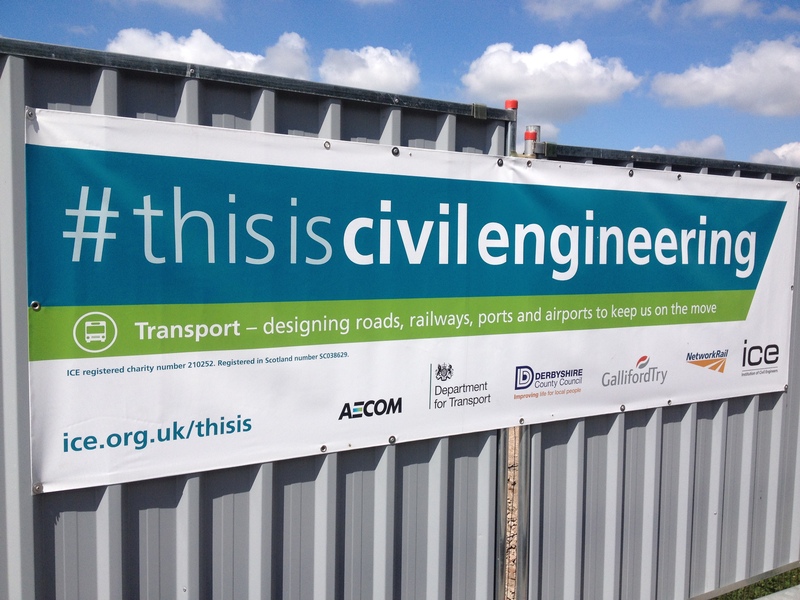 For full details see the Derbyshire County Council press release on the station developments. 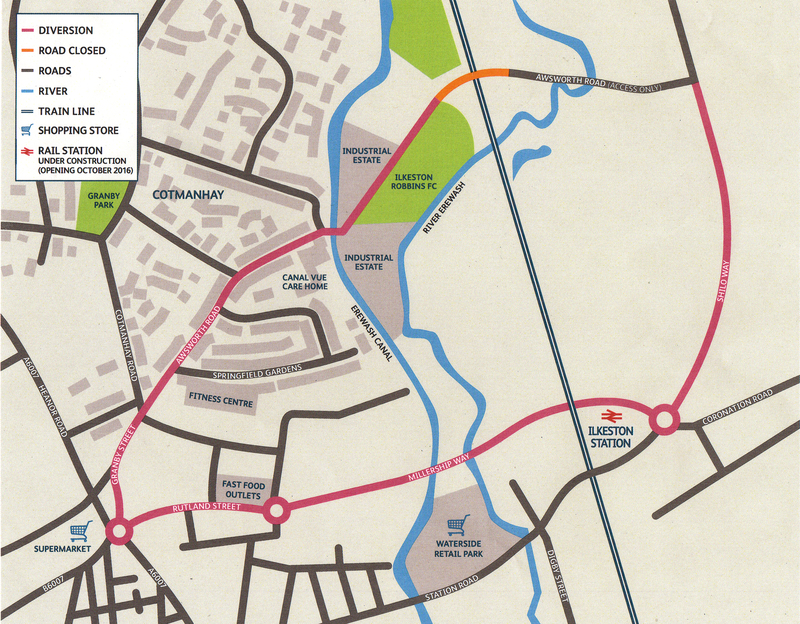 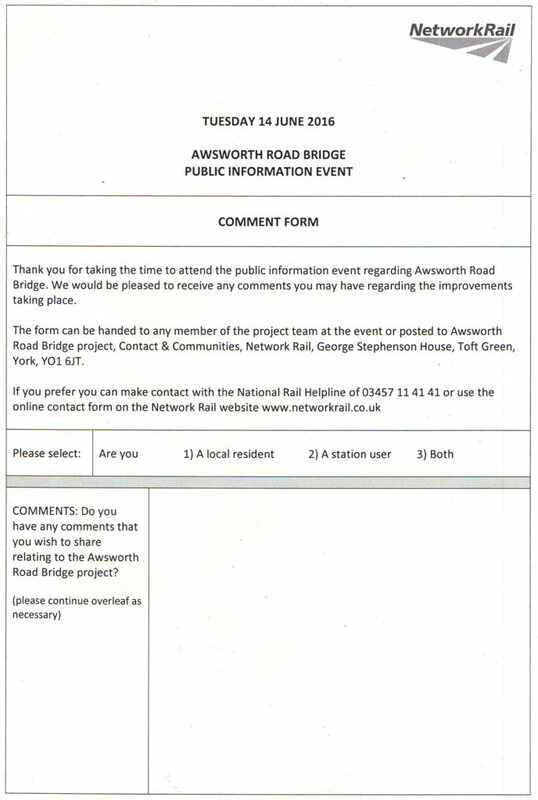 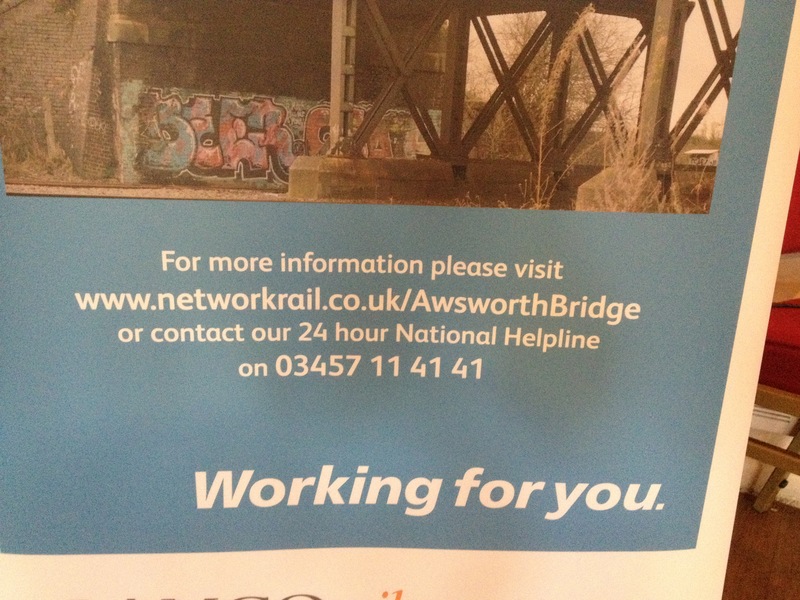 In June a Network Rail letter was sent out to residents in the Awsworth Road area to inform them of the construction works to be undertaken between September 2016 and April 2017. 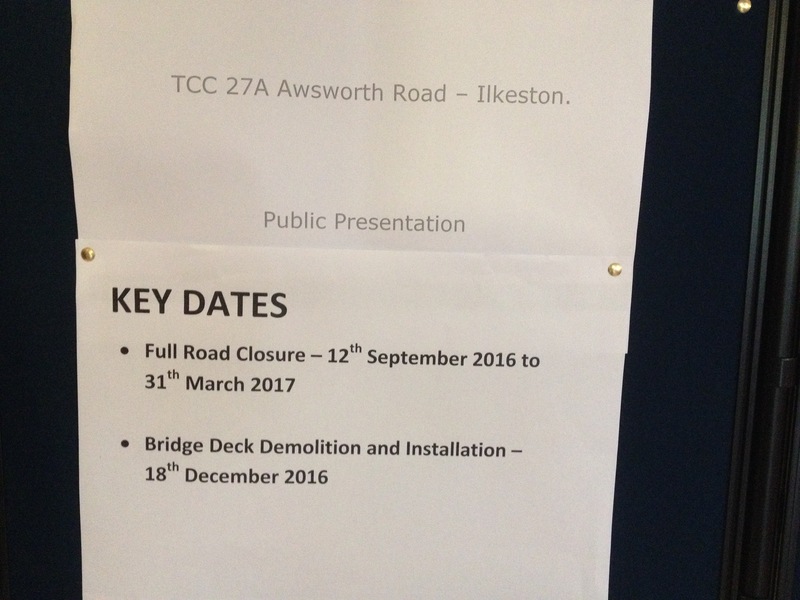 The 106 year old Awsworth Road Bridge will be improved with a significantly stronger and upgraded steel structure. 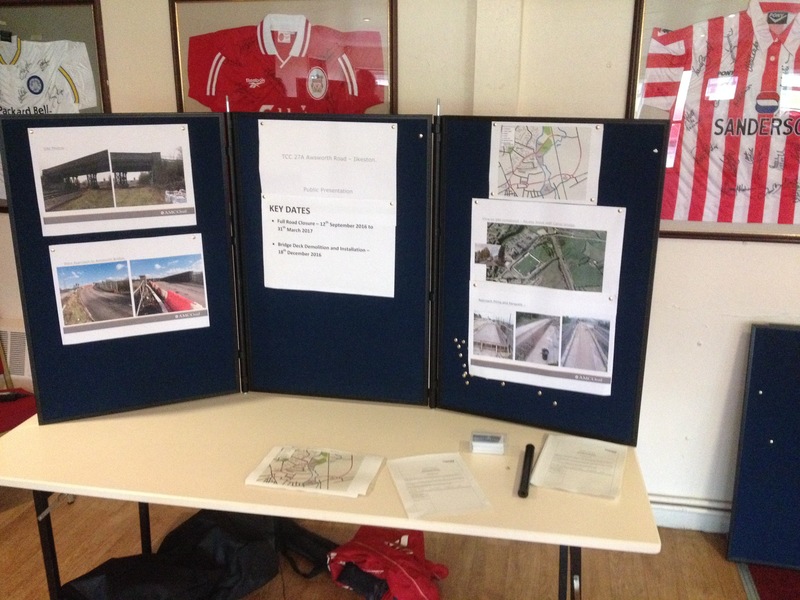 A drop in session for residents and businesses was held at Ilkeston FC on the 14th June and presented an opportunity to talk to those who would be managing the project.